Homemade hummus is delicious and easy to prepare, even for the novice chef. I like keeping it around for a healthy snack, and it’s a fast, easy appetizer to whip up for guests. This is a fun Mediterranean twist on my standard recipe. It yields the right amount of topping for the hummus, but might be overkill for serving all at once depending on the size and width of the serving bowl, so you might want to use two smaller bowls or a long, shallow dish. Hummus is typically prepared using garbanzo beans (also known as chickpeas), but I prefer to use white beans because of their smoother consistency. I typically use cannellinis, but navy or Great Northern beans work just as well. 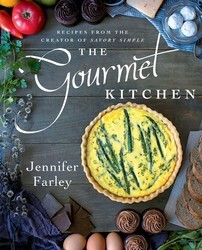 Try this delicious dish and more in my cookbook, The Gourmet Kitchen. 1. Place the beans, tahini, garlic, oil, water, lemon juice, salt, and pepper in a food processor. Pulse the machine several times and then puree the ingredients until very smooth. Taste and adjust the seasonings, if desired. 2. If serving with pita, preheat the oven to 350°F. Cut several rounds of the bread into wedges and place on a baking sheet. Toast until crisp, 5 to 7 minutes. 3. 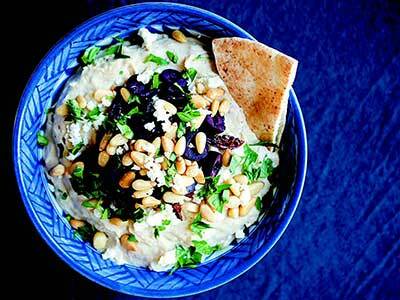 Place the hummus in a large serving bowl and top with the feta, olives, sun-dried tomatoes, pine nuts, and parsley. Serve with pita bread, if using.